My heirloom collections have all had particular themes, like eyelets, special stitches like those created with wing needles and candle wicking. For my latest collection I have focused on creating delicate narrow ribbons of lace motif fills, that not only imitate lace lace insertion, but can also be easily adapted to shadow work, so the Royal Heirloom collection is very versatile. It is fascinating to create these designs always with heirloom projects, like Christening gowns in mind. As the Royal Heirloom collection develops I have discovered all sorts of interesting facts about these designs. 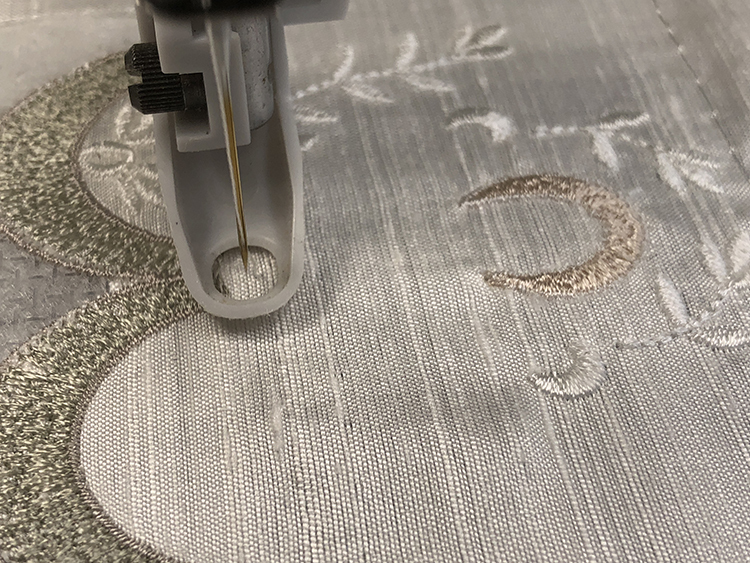 Whilst preparing the third set for large hoops it became obvious that several designs should have optional scalloped edges, as they give a wonderful finishing touch to embroidery projects. 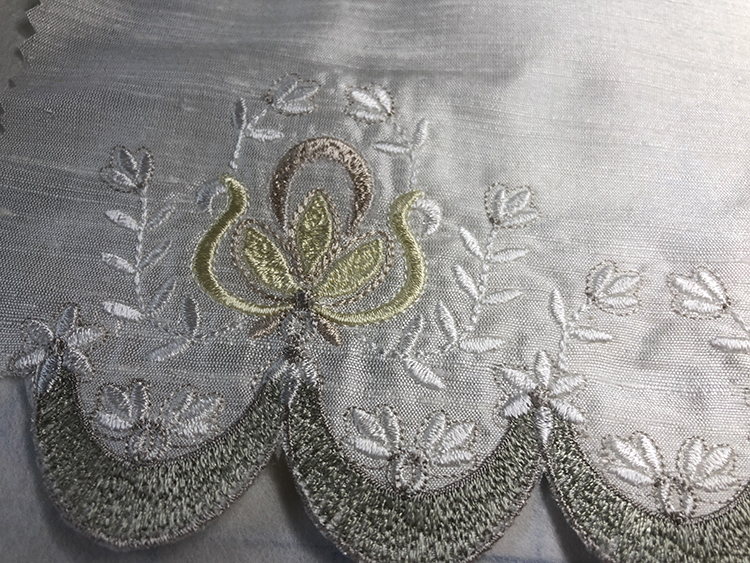 Now making a scalloped edge is much like cut work embroidery except the cut work in done on the edge of the design. Design #5 & 6 have this option. To successfully create a scalloped edge, the design needs a stabiliser that ideally can be washed away leaving a perfect edge. That presents a slight problem when you use silk dupion as frequently as I do, or any other silk fabric for that matter, but I will address that later in another blog. 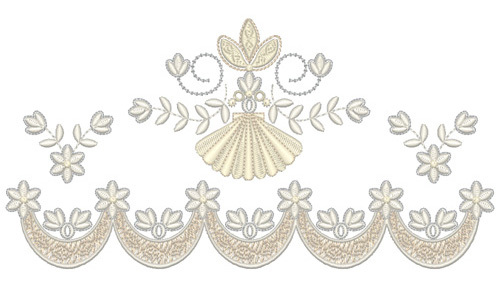 These two designs have almost identical scalloping so they could be used together maybe. In both designs the tiny flower on the right is stitched out last, so it need not be stitched if the same design is going to be stitched on the right hand side for an “endless” border. I see this edging as perfect for the hem of a scarf, a Christening gown or coat! 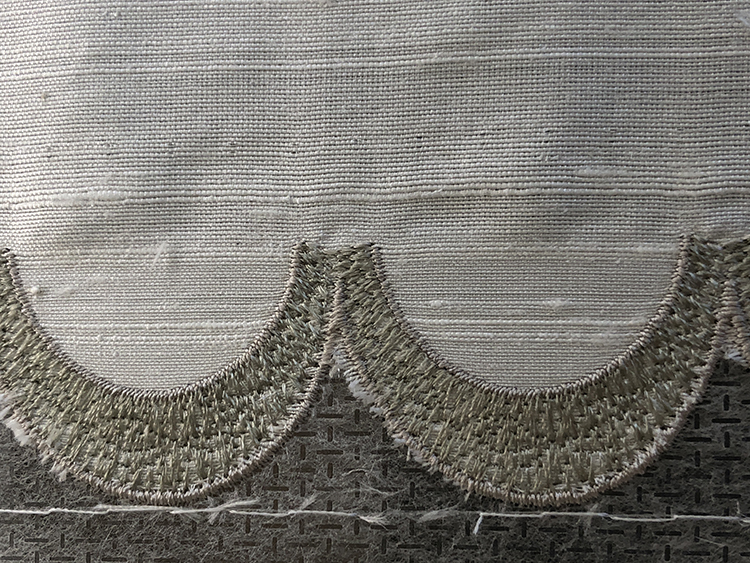 To create a scalloped edge the main section of the scallop is stitched out, and then the fabric is carefully cut away leaving the stabiliser intact. This technique requires the very best scissors, and after a great deal of experimentation I always cut the curves of scallops with my curved scissors. It make sense, and I do one side of each scallop, turn the scissors around and do the other sides. Any fabric threads which protrude after the design is finished can be carefully trimmed away with the sharpest of scissors. To finish off I do any trimming especially in the corners with my tiniest of straight pair of scissors. Now for this stitch out I used Sulky soft and sheer, knowing that I would not wash away the stabiliser as the design was stitched on silk dupion which is NOT washable. I was going to try and trim the stabiliser away under my natural daylight that has a magnifying glass, and see what sort of results I got. The results were fine I think. I could have used a heat away stabiliser as an alternative, but I do find these can be messy. If you are attaching fabric to hooped wash away stabiliser, spray the back of the fabric not the stabiliser! I will address this in another blog in more detail, as I am keen to do some embroidery on silk organza. 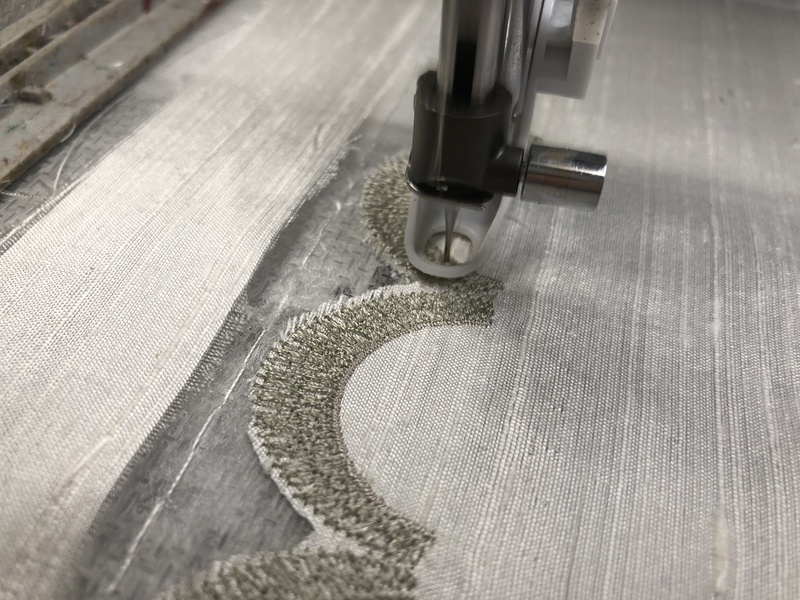 This entry was posted in Discussing machine embroidery, New Designs and tagged development of embroidery, heirloom embroidery, machine embroidery, making scalloped edges. Bookmark the permalink. Hazel, this new set is gorgeous! Thank you Debe. Are you considering what you could embroider next? Hi Hazel, I love this gorgeous scalloped border that you have created and digitized for delicate fabrics. The flowers and motifs are beautiful and really add a special touch to the scalloped border. I can just imagine how beautiful these designs would look stitched out on wedding veils and or gowns. Your intricate step by step instructions makes it possible for even a beginner to achieve beautiful results. One of my new collections which will come out this year has been digitised for embroidery on tulle, with wedding veils in mind. Wouldn’t it be wonderful to examine the detailed embroidery on Meghan’s wedding veil? We just didn’t get to see the close up detail of the workmanship. I love this collection! As always your designs have a way of making your projects look elegant. Your attention to detail makes such a huge difference. This is why everyone loves your designs. They’re perfect. I agree with the gal above who appreciates, as I do, your detailed inst! It makes it possible for even beginners to follow and complete a project with perfection! I can’t wait to see what’s next!!!! We are all learning and discovering new skills and techniques in machine embroidery. I am rather isolated here in Southern England with no main embroidery machine dealers nearby. My dealer is four hours drive away and I am scheduled to visit this week. I think that it is very important to share ones knowledge and experiences, both good and bad with others. For me at this time, the internet is the only way to do this, as I am not in a position or place to give classes.